Coleraine coach Trevor McKendry was ‘gutted’ about the late penalty decision that denied the Bannsiders a Europa League qualifier win in Serbia. The Irish Cup winners were on the verge of beating Spartak Subotica in their first leg tie until the hosts equalised with a 96th minute spot kick. McKendry said he was hugely proud of the players inspte of the injury-time disappointment. “I looked at the penalty again and thought it was soft,” said McKendry. “Our first instinct was that we were absolutely gutted for the players because they had worked so hard and were excellent to a man. “But then you get back into the changing room and you realise the game is still alive, while this time last year the game was dead and buried. Ian Parkhill was adjudged to have brought down Nemanja Glavcic and Mile Savkovic scored from the spot. Darren McAuley had given Coleraine the lead in the first half from close range. 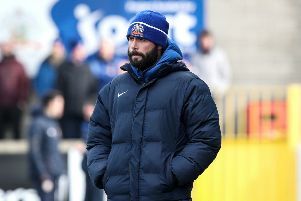 McKendry, who took on a more senior role for the trip in the absence of manager Oran Kearney and assistant manager William Murphy, was delighted with how the players carried out the game plan. “I’m proud as punch because the players took everything that we had been working on during the last few weeks into the game,” he continued. “It’s different when Oran and William aren’t here but the players were superb. Looking ahead to the second leg at Ballycastle Road on 19 July, McKendry believes the experience of Kearney and Murphy will give the players a boost. “The tie is very much still alive,” he added. We are still in with a chance and it’s all credit to the players. earney will have returned from a family holiday and will be back in the Coleraine dug out for the second leg.